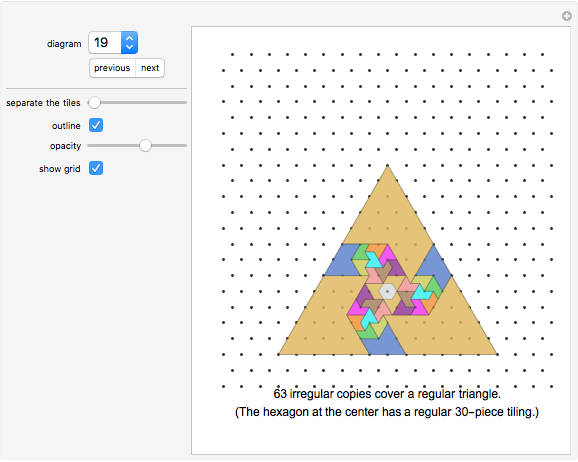 The tilings shown in this Demonstration each use only one shape, but various sizes of this shape. Such a tiling is called an irregular tiling. If all tiles have different sizes, the tiling is called perfect. Some of the tilings are very difficult to find. Nearly all material presented here has been taken from the book A Puzzling Journey to the Reptiles and Related Animals, privately published by the author in 1987. With any polysquare or polyiamond you can ask whether such a shape tiles a square or triangle in an irregular way (using copies of various sizes). 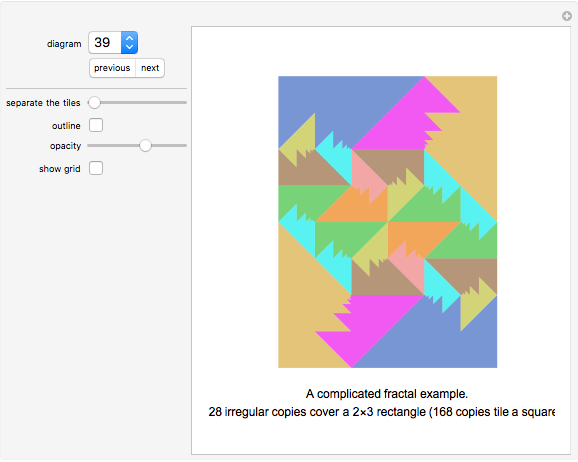 For this Demonstration the most interesting cases of irregular tilings have been selected. 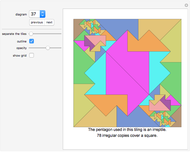 Since the author's book was published on irreptiles, the problem area of irregular tilings has seen a steadily growing interest amongst puzzlists. 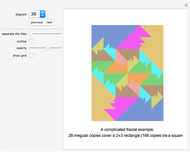 Many very simple cases of irregular tilings and a few very complicated cases are omitted in this Demonstration. Also excluded are all self-tilings of irreptiles; they are covered by the separate Demonstration "Irreptiles", created by the same author. 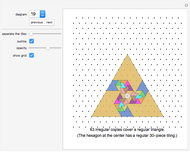 Diagram 1 to 19: Irregular tilings of a regular triangle. Diagram 20 to 29: Irregular tilings of an isosceles right triangle. Diagram 30 to 37: Irregular tilings of a square. Diagram 38 to 39: Irregular tilings of a rectangle. Diagram 40 to 44: Irregular tilings of a regular hexagon.